Reconstructed into operating condition steam operated fire pumps and wagons for local museums. 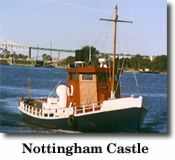 Completely restored and operates the steam driven historical vessel "Nottingham Castle". Converted the 30' work boat "Wisp" to steam operation. Operates an original "Stanley Steamer" car in local charitable parades. The company is a major supporter of the " Sault Ste. Marie Great Tug Boat Race" and parade held each July on the St. Mary's River, with all revenue going to local charities.